The rookie crop is strong, but can any of them overtake Doncic? The 2018 NBA Draft featured an impressive rookie class, and multiple players are already making big impacts in their first NBA season. As we approach the All-Star Break, it’s clear Luka Doncic of the Dallas Mavericks is the favorite for NBA Rookie of the Year. The race isn’t particularly close at the moment, but there’s still half a season left. Can anyone challenge the Slovenian for the award? If Doncic’s draft class was redrafted today, there’s little question the 19-year-old small forward would be the first selection overall, instead of him going third. Doncic has been outstanding for the Mavericks, and has shown far more maturity than one would expect for a teenager. In 49 games, Doncic is averaging 20.4 points, 5.4 assists. and 6.9 rebounds per game, and he’s also become the youngest player ever to record a triple-double. Doncic is a versatile guard/small forward with a high IQ, a nasty handle for his size, is a plus passer, and has the ability to create his own shots off the dribble. 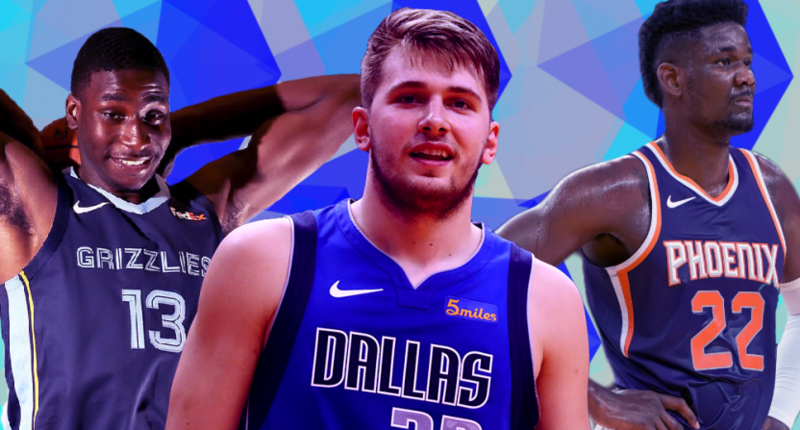 Doncic might not be an All-Star in his rookie season, but he should be, and he’s one of the ten most exciting players to watch in the association. Here are the potential challengers to Doncic for the Rookie of the Year award. In practically any other season, Ayton might be the Rookie of the Year. Ayton, taken first overall by the Suns, has enjoyed a solid rookie season. In his first season in Phoenix, Ayton’s averaging 16.4 points, 10.6 rebounds, 2.0 assists, and 1.0 blocks per game, while shooting nearly 60 percent from the field in 47 games. The Bahamas-born center is a bit of a throwback player. Checking in at 7’1″ and 250 pounds, Ayton is an explosive finisher around the rim. While there are still questions surrounding his motor and defensive abilities, he’s been an effective scorer this season, despite the Suns lacking a true point guard on their roster. I’d love to see how Ayton could do with a much-better roster around him. Right now, it’s him, shooting guard Devin Booker, and little else. Ayton can’t stretch the floor like modern NBA centers, but that hasn’t squashed his effectiveness. Give him the ball in the post and Ayton will score. As long as he remains efficient and engaged, he’s got a bright future ahead of him. Even though Memphis has completely fallen apart in January with 14 losses in 16 games, Jackson, drafted fourth overall out of Michigan State, remains a steady contributor who’s shown an impressive two-way game for a 19-year-old power forward. At 6’10” with a ridiculous 7’4″ wingspan, Jackson is a monster on the defensive end. He’s quick and can switch on smaller or bigger defenders when needed. In the paint, he’s a block machine. The 2018 Big Ten Defensive Player of the Year is more than just a good defender. Offensively, Jackson’s game has arrived much quicker than expected. In a slow, grinding Grizzlies offense, Jackson has produced at a stable pace. He’s fifth among rookies averaging 13.4 points per game while shooting 33 percent from three, 51 percent from the field, and 78 percent from the line. While I don’t expect him to ever be a number one option offensively, he’s proved he’s more than capable at putting up points. If the Grizzlies tank and give Jackson more offensive responsibilities, he’d be the biggest threat to Doncic’s Rookie of the Year candidacy. Trae Young was one of the most polarizing players to come out the 2018 Draft in June, and he’s still one of the most polarizing players from the Draft in January. The Hawks took a massive gamble when they traded the third overall selection (used by the Mavs to take Doncic) for the fifth pick and a future first-round pick. Atlanta nabbed Young in the lottery, despite the unfair comparisons to Steph Curry about his shoot-from-anywhere mentality. So far, Young’s been a real mixed bag for Atlanta. Young’s been inefficient from three-point range, making just 29 percent of his 5.4 attempts per game on the season. One game, Young will hit five three-pointers, the next he’ll go 1-9. He was particularly terrible from distance in December, shooting a terrible 19 percent on more than five attempts per game. In January, he’s shooting a much better 33 percent, which is still underwhelming for how hyped he was out of Oklahoma. With all the issues with Young’s three-point shooting, he’s still proven to a valuable starting point guard for the Hawks. The 20-year-old point guard is an elite passer, leading his rookie class (by a wide margin) with 7.3 assists per game. Young’s particularly good at finding teammates on the break. Young was trying to prove too much too soon and his game suffered because of it. He’s still got big-time shot-making potential, but he needs to make better decisions on when to shoot. He’s not Steph Curry, but he’s far from a bust. The Kings still haven’t fully committed to Bagley, taken second overall in the 2018 draft, at power forward, but the 19-year-old Duke product has proven he’s the future for the Kings at the position. Athletic and full of energy, Bagley has shown real potential in 37 games with Sacramento in 2018-19. While he’ll never be a great shooter or defender, the 6’11” power forward has provided instant production off the bench for the surprising Kings. He’s a plus rebounder (especially on the offensive glass), and is also great on the fast break and finishing at the rim. Despite averaging just 23.6 minutes per game, Bagley’s put up 12.9 points, 6.6 rebounds, and 1.0 blocks per game while shooting 52 percent from the field. He’d be given higher consideration if Sacramento increased his usage and used him more instead of veteran Nemanja Bjelica, but Bagley is a can’t miss prospect who’s going to be a great tandem piece alongside point guard De’Aaron Fox for years to come. It’s Doncic’s award to lose at the moment. Ayton and Jackson have been productive enough to warrant being in the conversation and could surpass him with incredible finishes to the season. However, barring injury or a sharp decline in production, Doncic is going to deservedly win the NBA Rookie of the Year award this season. He’s been the best player of a very talented group.